It is fun to make Stone Soup especially for a gathering. Everyone brings their favorite ingredient to add to the pot and shares the resulting soup. There is abundant soup for everyone to enjoy and lots for taking home too; win-win! I have made this "group soup" several times involving from about 15 to 30 individuals and although it varied, the soup turned out amazingly wonderful every time. I used every container that I could spare and once some people even went home to bring more containers so they could take home their share! Everyone was asked to bring about two cups of prepared vegetables, cooked beans, etc ready to add to the pot. If it was a small group, each one was asked to bring two ingredients; if it was a large group one was sufficient. Each brought their favorite, root, leaf, or above ground vegetables or those that started with the same initials as their first, middle, or last names, etc, etc. Make it as challenging or easy on your guests - the whole point being sharing and having fun :D. Some of the uncommon veggies my ingenious guests brought are endive (both Belgian and heading type), edamame (green soy beans), kohlrabi, turnip greens, or cooked dried beans. The common vegetables included carrots, cabbage, onions, potatoes, tomatoes, peas, corn, green beans, zucchinis, etc. I usually start the soup before the guests arrive - by making the base with the barley. When the guests arrive, I bring the soup to a boil, add their contributions in the order of their cooking times and finish it off. A word on using noodles: typically cooking them directly in the soup will result in overcooked or soggy noodles; but adding them (cooked 'al dente') at the time of serving instead will prevent that. Do plan on serving some as it is fun for the children of all ages in your party ;D.
CAUTION: If you are actually going to use stones, do use large hard ones without any cracks in them such as smooth quartz so they do not fall apart during cooking and are easy to remove at the end of cooking and no one would accidentally chomp on one and break a tooth - ouch! The beautiful stones actually do look magical! But if stones seem too crazy or weird to pop into a soup, just leave them out; beautiful many-hued beans, potatoes, other vegetable chunks, etc can stand in for them. Heat the oil in a large soup pot and cook the onions and the herb sprigs with a pinch of salt and the red pepper gently until translucent. Add the celery and cook for a few minutes until they begin to soften slightly. Stir in the garlic and cook for a couple of minutes. Add the barley, turmeric, about 2 quarts of the stock, and the magical soup stones if using and bring to a boil. Simmer until barley is tender - about 40 minutes. Stir in the carrots, potatoes and corn and simmer for about 10 minutes. Add the rest of the veggies, cooked dried beans with their cooking liquid and cook until just tender. 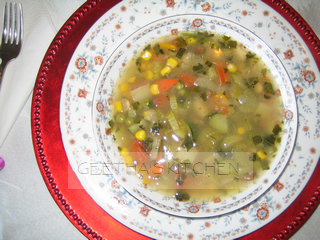 Add more stock or water to thin the soup to desired consistency. Remove the bay leaf; stir in the chopped herbs. Place a spoonful of the noodles in bowls and fill with soup. tasty and healthy recipe.. nice click!! This, my dear and kind friend, is a delectable soup worthy of my utmost respect. This is truly a serendipitous discovery! Humour me as I reminisce; ah - the mellifluous tones of the cooking pot, the entrancing smells, the joyful conglomeration of colours reverberating in their exquisite manifestation! My ambitions to make the perfect soup are crushed; they have been rendered to nothingness. Thank you for this gift - for this glimmer of light into an otherwise kafkaesque existence. Thank you HC and Anon for leaving your kind comments. Anon, I am glad that this recipe has brought you such joy! Don't despair, a soup does not have to be an all-time perfect one - if it is perfect for the occasion, that is sufficient. I can see that you are no ordinary cook from your poetic description about the transcending experience of cooking. Keep on cooking :D!